Joe Murphy, who looks at upcoming technology trends for libraries, has produced a presentation called '60 Apps in 60 Minutes'. Presented at the Special Libraries Association conference in collaboration with Scott Brown, it gives an overview of mobile apps for information professionals. Apps for medical librarians/info pros include apps such as Merck Manuals for quick reference and Dragon Medical Search for quick searches on medical websites. EasyBib enables users to create accurate MLA, APA or Chicago style citations by scanning a bar code or entering manually. References and citations can be exported to EasyBib.com's bibliography management service. Klout measures the social impact of your online presence and is available as a mobile app. The longlist for the Information is Beautiful Awards was announced this week and it is impossible not to be inspired by the nominees. Categories include Infographics / Information design and Data Visualisations and there is also a section for the best tool or website. Piktochart, recently highlighted by Alex, is just one of the applications to make the list. The infographics really encapsulate the value of presenting data and information in a visually engaging way. In contrast with tabular or more traditional representations, the graphics are immediate, accessible and undoubtedly help to generate a wider audience. However the visualisations also manage to capture something bigger still, serving as a social, political and cultural record. Who Is Occupy Wall St?, The European Debt Crisis and Cover Mania all immortalise aspects of our current social landscape in a way that emphasises the value of both data and dissemination. Users. Customers. Patrons. Clients. Subtle yet crucial semantic differences exist between these terms, yet they are often used interchangeably (I will reserve that discussion for a future blog post however :)). Regardless of such technicalities, the fact remains that library services generally aim to be user-centred, informed by patron needs, and responsive to the feedback and changing preferences of our customers. In theory, this of course is a good thing. However, sometimes I wonder if, in the rush to gather student feedback and to ask faculty or staff about their requirements, we spend enough time focussing on our non-users? The unanswered emails, empty seats and poor survey response rates are frustrating for any librarian, but the silver lining of such obstacles is that perhaps they offer one of the most valuable channels for potential service improvement. Often those who are already frequent or heavy library users and engaged with library services are reasonably happy with the level and quality of service delivery and clearly some, if not all, of their information needs are being met or supported. Otherwise they would not continue to use the service. The feedback we get from these individuals is obviously still of great value and serves as an important mechanism for monitoring performance, particularly as it is arguably one of the most easily obtainable sources in this respect. But what about the so-called disengaged? That is, those who obviously feel that the library offers nothing of real or unique value to them, or those who aren't easily reached through our existing communication channels. How exactly we can target the seemingly untargetable is clearly not straightforward, and most likely a complex matter that which requires an innovative and creative approach. What is clear however, is that out current services and channels are obviously failing to engage these individuals, and so we must do something different. What can we offer to turn the non-users into users? Where can we create additional value to attract new customers? In the same way that a start-up targets a gap in the market - a latent need that is not being met - libraries must adopt a similar perspective. 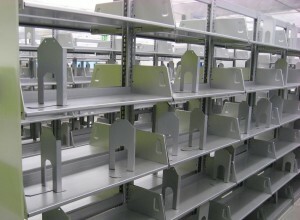 That is not to say that libraries have to expand outside their core functions and strategic objectives, but there is often still significant scope to reach these goals by using new approaches, marketing and mechanisms which may help to draw in these users, or at the very least heighten awareness. So perhaps the question should not just be what do our users want, but also what do our non-users want? 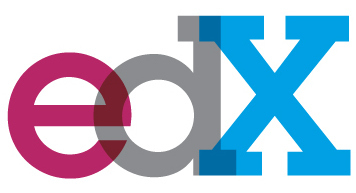 Is the current MOOC model in higher education sustainable? This week I came across Coursera, a company which has partnered with several high profile universities to offer MOOC (massive open online courseware). The tagline that promises "The World's Best Courses. Online, for Free" seems like a no-brainer for potential attendees, and I readily signed up for a few interesting courses including Edinburgh's module on E-learning and Digital Cultures. But what is in it for Coursera, and indeed the institutions that produce the content? This very issue, and in particular the contract between Coursera and the University of Michigan, is highlighted in the Chronicle of Higher Education. It seems Coursera themselves are not even sure how they will ultimately generate a sustainable revenue stream, but one possibility is through commercial advertising and sponsorship. However, The Chronicle states that "when and if money does come in, the universities will get 6 to 15 percent of the revenue"; in short, those investing in, developing and producing the content and materials will get less than a sixth of any revenue generated. One silver lining is that all IP rights remain firmly with the institutions. Whilst there are obviously other potential gains offered by the promotional heft of the Coursera platform, I still wonder why the institutions have signed up to such a seemingly inequitable agreement with a commercial start-up. Surely the prestigious universities involved (Princeton, Stanford, UPenn) could focus on their own individual platforms, or more realistically, join the existing edX not-for-profit alliance started by MIT and Harvard? Perhaps it is the lower up-front investment of the Coursera model that is attractive, even if a little myopic. A substantial $60m has already been invested in edX and "officials at MIT and Harvard said that eventually edX will have to figure out a way to be self-sustaining, and it does not have a business plan -- another aspect it shares with Coursera". How open courseware will be supported long term - via institutional investment or commercial start-ups - remains to be seen. The near-zero marginal cost model of online education theoretically pushes prices close to zero also, and the trick will be to use these products to upsell or cross-sell to higher margin offerings such as degree programmes. The University of Washington has just announced exactly this - they will now be offering for-credit courses through Coursera, in line with the pricing of their existing UW fee structure (around $2000 per module, or $5000 for a set of three). Aside from these paid credit courses however, at present MOOC is generally being subsidised by the high tuition fees paid by the students who are attending the institutions and until the cost curve of higher education changes fundamentally, this will likely continue to be the case. Unfortunately July’s #irelibchat was a little quiet, so we are taking a break until September when hopefully everyone will have returned from holidays. Based on feedback from those who were unable to make it (thanks to everyone who took the time to get in touch), we will also probably change the day to Wednesdays (Tuesday is already taken by our #uklibchat friends, do check it out if you have not done so already). For the next session we might also break with the #uklibchat format and go sans-agenda and see what happens! Thanks to everyone for all the support, RTs and promotion, and hopefully we can resuscitate #irelibchat with the back-to-school enthusiasm of Autumn. The Kentucky Virtual Library (KYVL) developed this superbly designed Research Portal for primary school kids. An interactive graphic gently introduces children to the idea of doing research in a playful and very engaging way. Via the analogy of space travel, you board a research rocket in search of new knowledge: Who was the first dog to go into outer space? What goes into your backpack? Ask yourself question such as How did you do?, Did you follow the plan?, Did you answer the main question?, Did you record your information? etc. Included is also a list of useful words. Finally, the Research Frontier reaches out to external resources such as Thesaurus and online databases. One way or another, this is one great tool every school library ought to include in its arsenal. Turning research data into something meaningful and visually engaging takes skill and time. But there is good reason for putting in the effort (see previous post). Information graphics, at their most basic level, visualise information to amplify cognition. If the process is carefully planned and executed, potentially boring stuff can be rendered into visual information stories that stick. 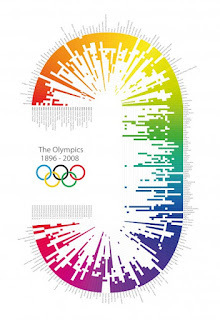 What data are good candidates for use in infographics? Depiction of information processes with if/then decision branches and multiple steps, or information representations that require a great deal of deciphering on the part of the user are no good. Decoding the information story and drawing conclusions should be straight forward and painless. 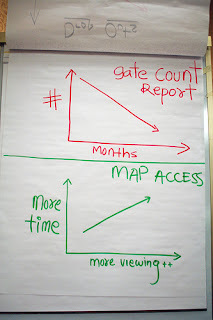 Ask yourself which data coming out of your library is suitable for use in an information graphic. For example, packaging descriptive statistical data (e.g. library survey data or library website analytics) is a good example. Other examples include the particular storytelling of multistep, sequential instructions; e.g. how to operate the self-issuing station in your library. Visualising the timeline description of a library project through an infographic may also be very effective when communicating with particular audiences. Another good use for infographics is to promote a library service/feature. Next week's #irelibchat topic, performance measurement and assessment in LIS, is a subject close to my heart. Quantitative measures of performance are an essential management tool in any organisation. Key performance indicators (KPIs) help organisations meet key strategic objectives, drive and deliver change, and assess the impact and effectiveness of services. Appropriate metrics not only provide a high-level snapshot of service levels at any given point in time, but also help to inform the operational activities and tasks that contribute to achieving the key strategic goals of the organisation. These are all useful and informative to a point. For instance, a cost per use analysis undoubtedly serves as a useful framework and heuristic for collection management. However, most of these measures are input- or user-focused, rather than based on the key strategic and desired outcomes of the library, and indeed the wider organisation. What do hastily-collected surverymonkey snapshots (80% of people borrowed a book in the last month; 90% of users said they found library services very good or excellent...) or activity-based metrics (the number of information literacy sessions delivered increased by 20% year on year) really tell us about the value and importance of our services? To paraphrase Ann Ritchie*, it is not simply enough to know what we do; we must also know why we exist. I find it helpful to think of this in concrete (if unfortunate!) terms: if the library closed tomorrow what would be the impact on key strategic outputs and outcomes? These variable are what we need to measure. Rigorous performance measurement and assessment is arguably one of the most potent tools for library advocacy when done well. If you can show that library and information services are feeding through to the bottom line - an increased volume of research, higher quality learning, more clients, more profits, improved patient care, lower costs - it is a very strong and persuasive argument. So how do we do this? Firstly, it requires a strong understanding of your organisation's mission and strategic objectives and goals, understanding where we can and do add value. The indicators and data you generate are ultimately only as good as the tools you use to collect them; valid and reliable methods and instruments are therefore crucial. These can be surveys, pre- and post-tests, curriculum-integrated assessments, statistical regression etc. Right now, I know I don't do enough of this, but sometimes the challenge just seems too vast to tackle. Every survey or hard-won statistic seems to barely dent the morass of measurement. But even if we don't quite get to collecting the data, at least knowing what to measure and why, is an important and necessary first step. Registration for the 'Power Searching with Google' course ends on the 16th of July. The course is composed of six 50 minute classes and aims to empower users to find what they need faster. It will combine the Massive Open Online Course learning format with Google's social and communication tools to create a community learning experience. Many searchers (and librarians in particular) may already be familiar with several of the search shortcuts such as using the search box as a calculator (e.g. to find out what is 65 multiplied by 8, enter 65*8 in the search box) or to find out a currency conversion (e.g. to find out what a 100 euro is in U.S. dollars, enter 100 eur in usd), but this course aims to teach more advanced tips and techniques. Typing AND in your search is pointless, Google treats it like any other word. The OR operator works well however. There is a way to find terms that are near each other on a website. [keyword] AROUND(n) [keyword] (“n” is the number of words near the search terms.) e.g. Libraries AROUND (3) "spending cutbacks" will show you all the websites where the two search terms were mentioned within three words of each other. Typing cache:[url] or clicking on the cache function in the search results will show you an older version of the website. Visit Google.com/history to search your past searches. This feature can be disabled for those fearful of Google acting as a "Big Brother". A particularly nice feature about Google Images is that you can upload your own images and Google can search for similar images or even find information about the image if it is well known. Franz Enzenhofer has come up with a fantastic tool which even lets you search via a drawing you make or even use a webcam to upload a photo you take from your tablet or computer and run a search for that also. That Tim Buckley Owen’s classic text Success at the Enquiry Desk has been reincarnated as Successful Enquiry Answering Every Time, is perhaps reflective of the shift away from face-to-face reference encounters, towards handling remote queries. It is thus particularly welcome that this latest 6th edition embraces these new and emerging challenges so wholeheartedly. The book primarily addresses the issues and practicalities involved in the various stages of the reference query process, from introducing readers to basic questioning strategies and techniques, through to the factors to consider when presenting and packaging the final information product to users. Owen structures his approach around the simple yet effective tenet of “imagining the final answer”, illustrating how by identifying the ultimate purpose of the information, it will help to clarify the detail, complexity and nature of the answer required. In this respect the author emphasises the crucial need for staff to be cognisant of the often covert differences between users and their needs (hobbyist versus practitioner; a researcher compared to a student), in analysing the context of the query. As one of the primary changes to this latest edition, Owen outlines the unique challenges presented by juggling remote queries. Service quality has become increasingly important due to the minimal effort involved for the user in resubmitting a query to an alternative service or source if they are dissatisfied with the quality of your answer. Remote queries are also typically more labour intensive, as you can’t simply show your customer a selection of suitable print titles or search results for them to browse by themselves. Instead, you are solely responsible for filtering the information effectively, and distilling it into the key answer that your user needs. However, perhaps the most salient emerging issue that reference staff must be mindful of is the growing expectation that 24/7 web and online technologies, including social media, imply that a 24/7 reference service is also available. Reorienting user expectations in this respect is a tricky challenge. Thankfully the book also includes some useful suggestions and strategies for those occasions when you can’t find an answer or are running out of time to deal with a query, to help turn a potentially negative experience into a positive one. Owen includes one which I tend to use frequently in practice myself, that is, providing “a compromise answer” when you are unable to source the exact information required (e.g. try to source an alternative article on the same topic if you can’t source the particular one the individual is looking for). As a relatively slim ‘one-stop’ solution, the book is perhaps best suited to those with little or no experience in the reference field, particularly prospective or current LIS students or very recent graduates. The breadth of contexts that the book manages to cover, suggests that it may also be of particular value in the public library setting where the range of queries faced by reference staff is potentially infinite. More experienced professionals, or those working solely within a narrow discipline or subject area, may need to consult a more advanced or specialised text if seeking an in-depth treatment of search strategies or detailed guidance on subject-specific resources. 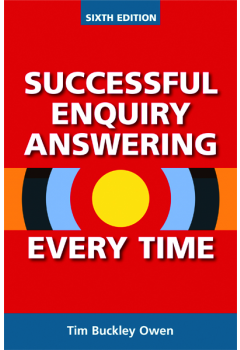 Successful Enquiry Answering is essentially a book about reference skills and not reference sources, yet this is not a shortcoming. As readers won't get weighed down by lengthy lists of books and websites, and instead can quickly grasp the skills they need to help them do their job more effectively, it results in a much more valuable proposition for the majority of needs. Thanks again to everyone who took part is the first #irelibchat last month. It's a shiny new month, which means it is time to do it all over again! 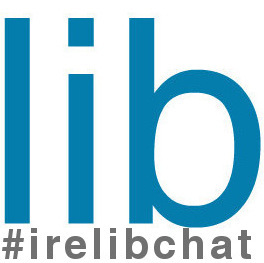 The next #irelibchat will take place on Thursday July 19th (Third Thursday of the month!) at 7:30-8:30pm. Again feel free to join in later or to catch up after the event through our tweet archive, or just search for the #irelibchat hashtag. The topic for this month's chat is the runner up in last month's poll: Performance measurement and assessment. 1. What is the appropriate balance between using evidence/data and instinct/judgment in decision-making? Do we need to adopt a greater or lesser focus on evidence-based library and information practice? 2. What do you currently measure to assess performance and service delivery (usage stats, borrowing totals, bibliometric trends etc.)? Have you developed key performance indicators? 3. What methods and tools do you use for data collection: user satisfaction surveys e.g. LIBQUAL, objective outcome-based measures, cost-benefit analysis, reference management products e.g. questionpoint etc.? 4. 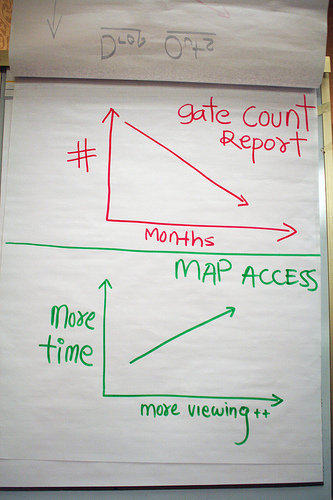 How do you use the data you collect: annual reports, advocacy, strategic planning etc.? 5. What do you believe we 'should' be measuring, but currently aren't? Why?